The report by Transparency Market Research (TMR), the global microcontrollers (MCU) market has highly competitive landscape. Some of the key players in the market are Fujitsu, Infineon Technologies, Freescale Semiconductor, Inc, Renesas Electronics Corporation, and Texas Instruments. The industry players are increasingly introducing improved and advanced microcontroller-enabled technology in various industry sectors for widening their customer base and to improve their product portfolio. According to a report by Transparency Market Research (TMR), the global microcontrollers (MCU) market is expected to expand with a CAGR of 9.0% from 2012 to 2018, to attain the value of US$28.49 bn in 2018 from US$15.7 bn in 2011. The automotive industry accounted for the dominant revenue share of 31.4% in the market in 2012. Region-wise, Asia Pacific is dominating the global market followed by the EMEA. The cumulative share accounted by both region is nearly 70.5% of the global market in 2012. The swift growth of global automotive industry is expected to impact positively on the growth of the microcontroller market. 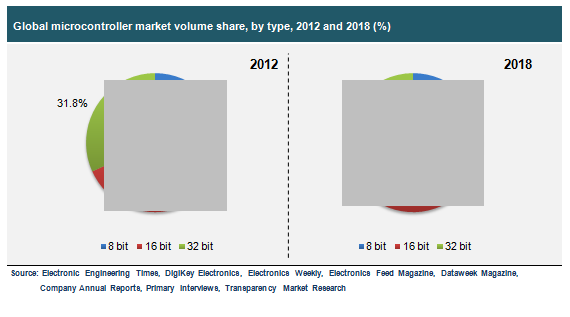 The availability of smartphones, phablets, tablets, and other touchscreens are boosting adoption of the MCUs which is likely to boost growth of the market. Additionally, MCUs have extensive application in consumer electronics such as microwave ovens, washing machines, and television. Furthermore, increasing demand for healthcare equipment such as portable glucometers and blood pressure monitors which uses microcontroller are also considerably supporting for the growth of market for MCUs. Awareness regarding smart energy management, along with the latest technological advancements, is key driver of the global microcontrollers (MCU) market. A favorable regulatory initiations are supporting deployment of smart grid systems which is likely to boost growth of the market. The technology is chiefly used in smart cards for ensuring better safety to electronic banking transactions and government IDs such as mass-transit fares, security applications, passports, and medical records. Despite of these growth prospects, malfunctioning of microcontroller in extreme climatic conditions such as extremely low and high temperatures are limiting growth of the market. Nevertheless, microcontrollers are manufactured as application-specific integrated circuits to be embedded inside devices they control. They comprise memory, peripherals, and processors coupled with the advent of the novel features such as GPS and keyless entry, the demand for MCUs in the automotive industry is higher than ever. This is creating lucrative opportunities for the growth in the global market for microcontroller.